The small British Columbia community and marine resort of Shearwater, formerly purchased from the airforce in 1947, lies 322 miles north of Vancouver's south terminal. Three miles from Bella Bella, the resort operates its own airstrip and may also be accessed by BC Ferry from Port Hardy. Calm, protected channels and access to all species of fish make this a good bet for the seasick-challenged among us. Its southern islands, for example, Spider Island overlap the northern territory of Hakai Pass situated 30 miles to the south. Summer fishing is influenced by: remoteness of location which provides early access to many runs of salmonids; rocky bottom structure for bottom fish and halibut; and, also many pristine freshwater rivers filled with Dolly Varden , steelhead and cutthroat trout . As an unusual feature, the land-based resort also offers both marine accommodation and fishing aboard its 45' charter boat, the Pacific Lure. Winter fishing is also available as the marine resort is open year round to land the lurking lunkers. All five species of salmon may be found at Shearwater: chinook, coho, sockeye, chum and pink . All five species are migratory fish, appearing as mature animals in summer and fall months homing in on a variety of central and southern coast watersheds. Large chinook arrive early in the year. Thirty to 50 pound white springs from Bella Coola and the Dean River filter through from May 15 to June 21. Good numbers of 5 pound sockeye provide another early species from June 21 - July 21. Unlike other areas of the province where pink runs occur every second year, Shearwater sees its share of these eager 4 - 7 pound salmon every summer from early July - August 7. The first coho arrive in early July as waves of 10 - 12 pound fish. Successive schools descend on local hotspots until September 21 with fish growing to a truly gargantuan 20 - 22 pounds for the McGloughlin River spawners. During the catch-and-release summer of 1998, 2100 of these beauties succumbed to anglers' offerings in the best coho fishing experienced in years. With commercial trolling curtailed and other conservation measures in place, coho fishing can only improve in coming years. A second wave of large chinook begin arriving early in July and continue shouldering through until September 15. These are the fabled Rivers Inlet chinook to 55 pounds destined for the Wonnock, Kilbella and Chuckwalla Rivers. 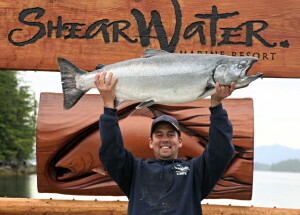 Of 369 chinook landed at Shearwater Resort in 1998, the average weight was a handsome 28.5 pounds. Chum invade the area from July 15 - September 7. Destined for Ocean Falls and Jenny Inlet, late August fish average a very large 15 - 20 pounds. True afficianados of our finny friends will know that a chunky chum in flight provides a truly savourable ballistic experience. Bait: As with other remote fishing areas, Shearwater supplies all tackle. Cutplugging with large 7 - 8" cutplugs sliced perpendicularly from dorsal to ventral surface with a 30 degree bevel from lateral to lateral side produces a slow, flip roll. Matched to ultra sharp 5/0 - 6/0 Gamakatsu hooks in a double sliding hook arrangement on a 6' leader, cutplugs are trolled with down riggers. Halibut and bottom fish are not as choosy. Whole herring rigged on a 2/0 treble, 5/0 single and 12 oz of weight slip into the deep from 6 �' ugly Sticks and Penn 309 levelwinds sporting 80 pound Tufline and 60 pound leader. Hootchies: Try the purple and blue, blue and white and, for coho, white on a 30" leader to a Hotspot flasher. The army truck pattern produces later in the season. For pink and sockeye try a small red Hotspot flasher and tiny pink hootchies matched to red Gamakatsu hooks, 30' on the downrigger. Spoons: The Luhr Jensen mother of pearl spoon fished all on its own works wonders with coho and chinook. 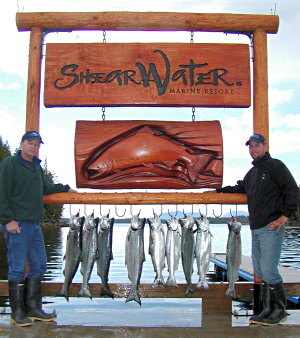 Shearwater has two types of fisheries: summer fishing for all salmon species; and, structure-related fisheries for halibut, lingcod and other bottom fish. In addition, two distinct fishing opportunities present thenmselves: fishing the rocky reefs and gravel shoals for bottom fish, and fishing the channels and islands for salmon. The salmon fishing hotspots are many in number and difficult to summarize (which, of course, is a boon to fishermen). All spots, including Tinky Island, Cape Swaine, Ivory Island, Cousins Inlet and Barba Point present excellent opportunities. The salmon move with the season and anglers troll after the fish. Early in July, Dryad and Idle Point often prove the hotspots, followed in midsummer by Cultus Sound and German Point. Later in the season, White Point, Codville Lagoon and Port John come into their own. Bottom fishing hits a level of brilliance found in few other remote locations. 15 miles southwest of Shearwater, Purple Bluff holds great numbers of halibut in the 40 - 60 pound class, with occasional fish rising to 150 pounds. Seaforth Channel and Deadman's Island have reefs where rockfish and 30 pound lingcod may be taken as shallow as 30'. Further south, Cultus Sound stacks the flatties and ling in the 80 - 150' rock piles.